This past Sunday Fiesta Mexicana had the wonderful opportunity to collaborate with Carmela y Más at the Musical Instrument Museum. 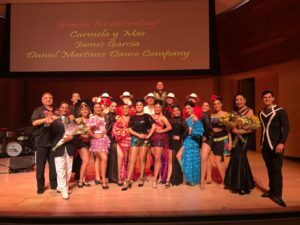 The production was an anthology of Latin Salsa and Latin Caribbean Music. We took a musical journey of Afro-Cuban and Latin-Caribbean music to the Americas. Thank you to our guests to James Garcia, Bella-Denise (Bella Q Dance Studio), Laura and Leo from Arazando Dance Co, also thank you to Carmela Ramirez for having us be apart of such an incredible project! Last but definitely not least thank you to our amazing Director Daniel Martinez, you are the best!